1 The dictionary defines the phrase "on thin ice" as literally meaning on ice that is too thin to support one's weight. The figurative meaning is in a risky situation. Both definitions apply to the polar adventures of Matty McNair. 2 Matty L. McNair is an American explorer who now lives in the Canadian Arctic in Iqaluit, Nunavut, on Baffin Island. Her passion for polar travel saw her lead the first ever all-female expedition to the Geographic North Pole. 3 Matty was born in Pennsylvania in the USA. She grew up in a family of outdoor enthusiasts. She has written that her first outdoor excursion was on a canoe trip when she was only two weeks old. She was involved with the Outward Bound Schools for twenty-two years. Outward Bound is a non-profit educational organization that promotes active learning expeditions. She authored a canoeing handbook for them. 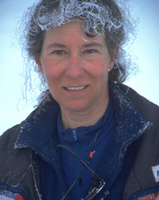 She has gone on to lead many expeditions throughout her career. Some of them were "on thin ice." 4 In 1997, Matty was asked to lead an expedition to the North Pole for Great Britain. It was to be the first-ever women's relay expedition to the Geographic North Pole. She accepted the responsibility of leading twenty "ordinary" British women across one of the harshest environments on earth, the Polar Ice Cap.